Heading back towards Arusha from Mto wa Mbu we took a left onto a rough track – a sign post announced 111km to Ol Doinyo Lengai. The driver warned us that this was a pretty bad road, and it would take some time, but we would have some fun all the same. We bounced along, past a quarry with a big Japanese flag outside – a Japanese road building company is very active sorting out a lot of the nasty roads in Tanzania at the moment. After this quarry the road did indeed turn pretty bad. We pootled along at a somewhat slower pace, and Isaac pointed out various different plants to us. 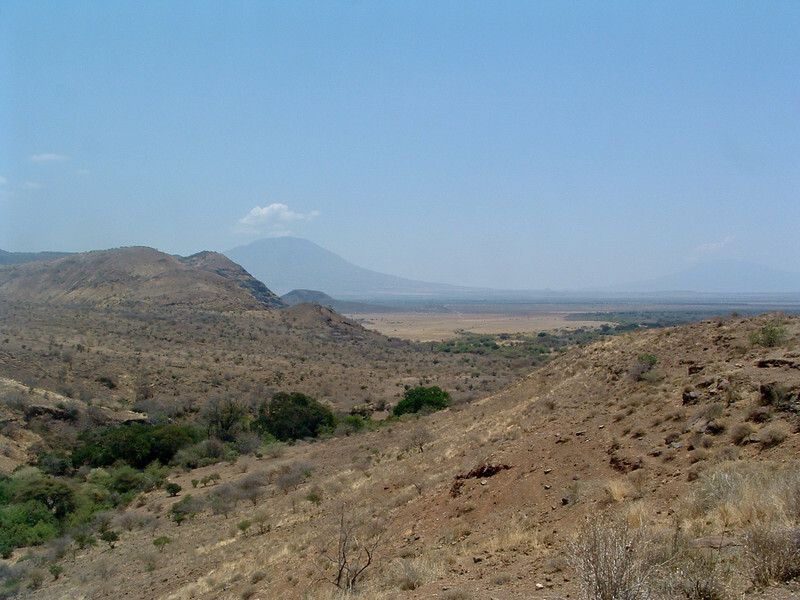 We drove north, parallel to the west side of the Rift Valley escarpment – spectacular scenery. As we reached the brow of a hill I decided we were paying well for this trip, so I would stop wherever I wanted to enjoy the view – stop! I shouted. I jumped out of the car and walked over the edge of a canyon and gazed down. The wind blew past my ears. Slowly I began to notice sounds – children playing. My eyes began to pick out figures on the other side of the canyon. Then suddenly a Masai village sprung out at me. I had imagined the place deserted, but in fact the whole area has quite a few people about. Unlike the well touristed road to Mto wa Mbu the kids were herding cattle, rather than dolling themselves up in ostrich feathers in order to charge tourists for cute pictures. Well, they were herding cattle when they weren’t throwing stones at our speeding Land Cruiser. Anyway, the view absolutely blew my mind, and I knew that from this point on we would have a pretty good weekend. We have been here for so long, but really not benefited from the stupendous landscapes that exist in Tanzania.